When opportunities come your way–whether that be presenting, bringing art to your community, sharing lessons, or anything else–should you put yourself out there? Cassie says yes. 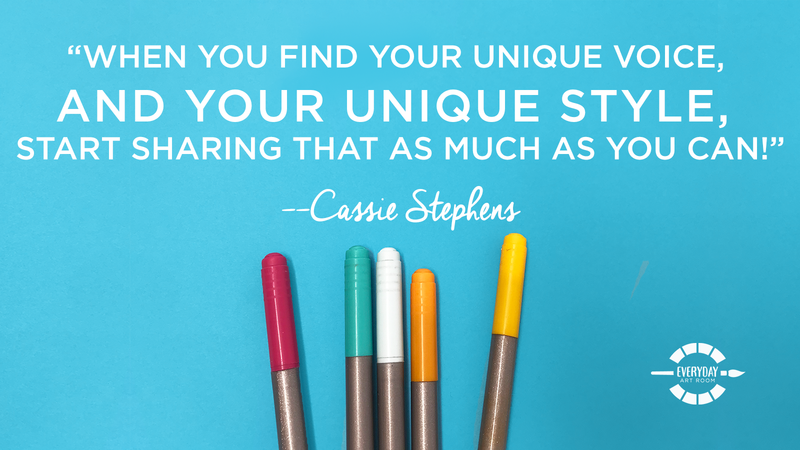 Listen as she discusses her own story on how and why she started sharing ideas from her art room, how to promote your unique voice, and how presenting can actually improve your teaching. Full episode transcript below. Cassie: I’m just coming off of my spring break, and national conference, and I’ve been hanging out with a lot of art teacher and buddies. It’s funny because I promise you, I have had the exact conversation with at least a half a dozen other art teachers. The conversation usually goes down like this. I’m feeling like I want to present, whether that be at national conference or on a state level or an online platform. But I just don’t know if I should or if I could be good at doing it. Or I’ve had the other conversation of, I feel like I have lessons that I want to share with teachers on either teacher pay teacher or I have things that I’ve created and I’m thinking about maybe selling them on Etsy, but I just don’t know about it. To that I say when I’ve had this conversation with friends, you should. Why not? Why not present at conference? Why not sell your lessons? Why not open up an Etsy store, if it’s something that you really want to do, and not just something that social media pressure is making you feel kind of obligated to do, if you know what I’m saying? Let’s talk about this today because this is something that I honestly have spent a long time thinking about as over the years, I’ve shared things on my blog and videos on YouTube and it’s something that I’m still processing. Is this what I want to do? Is this the path that I want to take? Or is it just something that I’m doing because the opportunity has popped up, or I feel like I should be pursuing it? All right you all. I’m Cassie Stephens and this is Everyday Art Room. A lot of the conversations I had over the past week and a half really involved presenting, because a lot of the teachers I was speaking with were at national conference, and many of them mentioned how, when they would be in a session, they would think to themselves, I could do that. I’ve done some really cool things in my art room, in my community. I’ve created some really fabulous lessons, things that my students have responded to, I should share them. The short and quick answer is yes, you should. You have a unique voice. You have a unique way of teaching art to your students, you have a unique relationship with your students that only you could have. 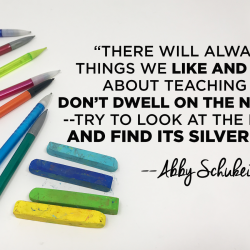 So, you need to find that unique voice, that unique teaching style, hone it and then share it, share it as much as you can with the art teaching world because why not? If it’s something that you want to do, why not do it? Let me tell you my story of how I first started presenting, because I was in the same place that a lot of the teachers that I was speaking with this weekend, and over the past week, were also in. I’ve been teaching for close to 10 years. I was doing a lot of things in my art room that I thought were very exciting. I created entire themes. I built my art room to look like Vincent Van Gogh’s studio one year. One year, our theme was Asia. I top to bottom transformed my art room. I literally spent every day of the summer in my art room doing these room transformations. It’s not something I recommend, because that’s what led to my 10 year burnout. After she hung out with me for the day, she said, “You know what, I really think that what you’re doing in your art room is different than what a lot of other people are doing. And I really think that you should present what you’re doing at conference.” This really took me by surprise, because I thought to myself, I’m not doing anything that I’ve never not done. I’m not doing anything that is unusual, am I? Well, what I didn’t realize was because I hadn’t been going out into other people’s classrooms and at that time wasn’t attending a lot of conferences, was that I was teaching from my own unique perspective and what I felt or I feel to be something that works really well for my teaching style and for my students and for my school. I preach that a lot on this podcast. 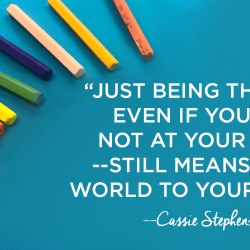 You need to do what works best for your students, for your setting and for yourself. That’s how you find your unique teaching style. She, my friend Rachel, you should follow her on Instagram @artsymata, she pointed that out to me. She said, “You’re doing something that’s different and you should share that.” That was the first time that I actually thought about it. I started thinking about it. And it wasn’t long after that, that I started a blog that I worked up the courage to apply to present at national conference, and even presenting for AOE on their online conferences. In retrospect, the advice I would give to you is don’t wait. After she mentioned, my friend, Rachel mentioned that to me, I waited a really long time, based on insecurity, based on just I don’t know, I don’t know if that’s something I want to do. If you’re even thinking about it, just throw that line out there. Go ahead and apply to present at Nationals. Go ahead and apply to present at your State Conference. Talk to your admin about presenting to the teachers on your staff. If you’re even curious, you should plug your nose and jump right in. Don’t feel beaten up if your applications or your ideas get shot down. The online application process for a lot of these conferences, it’s a little tricky because you have to write up an application. Sometimes your vision, your ideas that you have in mind might not come across well, it might not be something that they are, “looking for.” Even if your ideas get kind of shot down, we’ll say, that doesn’t mean that you shouldn’t keep trying, that you shouldn’t keep knocking at the door if that’s something that you want to do. If you’re even just on the fence about presenting, what harm can it do just to go for it? If you’re a little bit fearful of speaking in public, and luck, I get it, trust me. I actually in high school was on the speech team, and I was in a lot of plays. For me to get up and speak, it wasn’t as … It was scary, I’m not going to lie. Those first couple of presentations, definitely. When I do keynote speeches for state conferences, yeah, my hands are sweating at least the first 15 minutes until I get the crowd and my mind loosened up a little bit. But if you’re a little bit leery of doing it, but you know you want to, here’s some suggestions for you. You could present with a friend. A lot of the national conferences and even state conferences, you can apply to present with one person or even a group of people, and I’ve done it that way before. It does take a lot of the pressure off. Your buddies are in there, they’ve got your back, they can definitely pick up the pace if you happen to get a little bit nervous and you mix up your words of it. It’s great if you’ve never done it before, to give it a shot with a friend. Presenting to your faculty, or on a smaller scale like at state levels is also a great way to get your foot in the door. I’ll tell you the time … I’ve presented at state conferences, I’ve presented at national, I’ve been a keynote speaker at state conferences. I will tell you the time that … And I’ve done online conferences. So, I’ve kind of covered the conference scene, we’ll say. The time that I have been the most nervous is when I have to present to my faculty and staff. That’s the most difficult presenting right there. You work with these people. These people know you, and it’s tricky, not going to lie. But it’s a good way to get your foot in the door and make you feel more comfortable with it. Because the more you do it, the more comfortable you will become. When you do present, I’m just going to throw this out there, it’s important that you present your content, speak from your voice and your experiences, not the content of others. Not in something that doesn’t feel quite true to you. I’m saying this because there have been times when I’ve seen other people present, or I’ve heard about people presenting at conferences where it’s, I’m not going to lie, it’s my content, it’s my lessons. You can’t present somebody else’s lessons, even if they’ve been successful for you. Reason they’ve been successful is because they were somebody else’s who worked out the kinks for you. So, make sure that when you’re presenting … It’s not bad to share other people’s lessons, but you can’t present it as your own. Make sure, I cannot stress this enough, that you’re speaking from your own unique voice. That’s what’s going to make it something that people want to hear. People crave authenticity. When you’re speaking from your voice, that’s authentic. Sharing somebody else’s lessons or projects or ideas, that’s not authentic. If you do, share a snippet of it or say this is something that so and so is doing it, it’s really worked for me. Make sure you credit that source. But also, circle back to what you are doing, because that’s what people are wanting to hear. Now, let’s talk about the other kind of questions you might have like, should I open an Etsy store? Should I open a teacher pay teacher store? I feel like right now, on social media, on Instagram, there’s a lot of teachers opening shops up, opening teacher pay teacher, opening Etsy stores. I’m glad for it, but I’m also curious as to whether it’s a feeling of an obligation. I see my friends doing this, I see them getting a little bit of recognition for it. Maybe I should do it. Stop and think before your knee jerk reaction to open a store, an online store, before you do it. Stop and really think if that’s something that you want to do, or is it just something that you feel like you should do? If you don’t know the answer to that, then get a piece of loose leaf paper, a nice sharp pencil and an eraser. Sit and think about what are your long term goals? Where do you see yourself in five years? Where do you want to see yourself in five years? Start writing that down. In five years, do you want to have written a children’s book? In five years, do you want to be teaching? It’s okay if you don’t, but you do need a source of income. So, what’s going to replace your teaching income? In five years you want to illustrate, do you want to do X, Y, Z? I don’t know, only you are going to know. Sometimes, it takes a really long time to figure it out. I am 44 years old, just had a birthday couple weeks ago. I can tell you that a lot of times my loose leaf sheet of paper is blank, because I don’t know. And that’s okay. But grasping at what other people are doing and going down other paths because you feel obligated to do so, that’s not going to lead you to your goal, to even figuring out what it is. So, just start spending some time thinking about it and maybe less time thinking about what others are pursuing. If you’re thinking about presenting, opening a store, online shop of some sort, and you’re not certain, here’s a couple of suggestions. Think about it as like this. Is opening an Etsy store going to help you reach a long term goal? Do you know what your long term goals are? If you don’t know what your long term goals are, I say just start going for it. Go for something that is speaking to you, that is piquing your interest, because that is what’s going to help you figure out what your long term goal is. For me, I’ll tell you a story, and I know I’ve shared this before, in 2007 your girl right here was going through some really bad burnout. I was so over teaching. The reason being is because I’d spent the previous seven years reading every book that there was on teaching, combing through every Art Ed Magazine, spending every day, every day of my summer in my art room working on lessons and plans and decorating and I was burnt to a crisp. I had totally convinced myself that I had to either be an artist or an art teacher. Since I had decided to become an art teacher, I was to pursue that from the moment I woke up to the moment I went to sleep. It took me seven years to realize that was a big fat lie, you can actually be an art teacher and an artist. Being an artist, “might not be the vision that you were led to believe it was when you were in college.” It doesn’t mean you have to go live in New York City in a loft and be poor as can be and do nothing but paint 24/7. Even if that’s what you thought it had to be. Once I finally realized that being an artist means that you’re just creating, and that that can take on many different forms, I started to create. And I just started to create what was interesting to me. For me at that time, it meant that I was making belt buckles out of clay. I was selling the belt on my sewing machine that I was teaching myself how to use, and I was opening an Etsy store. It took a month for one belt to sell. But I can remember the moment that that happened, called my husband on the phone, wrapped that belt up so beautifully, zipped over to the post office, and I was on cloud nine. That was what I needed at the time. I needed to be making something that I was passionate about. I needed to have that little boost to my ego when a belt sold because that told me that what I was pursuing, people were interested in. I didn’t have a big picture long term goal at that point. But taking a break from putting all of my energy into teaching, and putting that energy into creating was definitely something that I needed at the time. That boost my ego helped me figure out some other things that I might be excited to pursue. 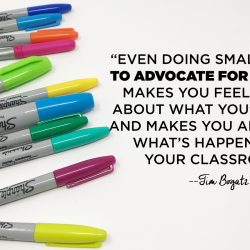 It led to me starting the blog that I have currently, it led to me feeling confident to share what was happening in my room, some of the things I was creating, and then that ultimately led me to presenting at conferences. Even if you don’t know what your long term goal is, pursuing something that is really interesting to you right now, not something that other people are doing, something that is speaking to you, I say go for it. That along the way is going to help you figure out what some of your goals might be. I am a person who dreams big and then has no idea how to get there. That’s tough. I think that’s a lot of us. Where you just don’t know. You know what your goal is, but you have no idea how to accomplish it. I’m right there with you. Something that I have started doing though, what now that I’ve figured out what my goal is or this big idea that I have. I’ve started saying no to things that take up my time and don’t get me closer to my goal. For me, what that looks like is saying no to conferences, saying no to presenting, saying no to writing up articles for things. I used to write for the local art magazine, and I recently had to step away from that. It’s just when you start to figure out what your goal is, then that’s when you have to start saying no to things that are taking you away from it. Even if it’s things that you feel like, yeah, I should want to present. Yeah, I should want to write articles. If it’s not helping you get closer to that goal that you’ve figured out what it is, then it’s time to start realizing that your time is so super valuable that you need to start channeling it to what your goals are. It’s not always an easy thing to do, because it’s flattering to be asked to do a lot of these things. But if it’s not helping you achieve your goal, even if your goal is just spending time with your family, which is a really important goal, then it’s important to start saying no. How do you figure out, how do you know what you want? Like I said, it is totally okay not to know. When I was going through my burnout 2007, I really really was thinking I didn’t want to continue teaching. I was so tired of teaching. Those of you that have hit that point before you know what I’m talking about. When you go to Target, and you look at that cashier and you think man, if I could just have this job where I leave work, leave Target and I don’t have to think about it. I don’t have to think about the mistakes I’ve made or perceived that I’ve made throughout the day. I don’t have to think about that one class that I struggled with. I don’t have to think about that lesson that just bombed. I don’t have to think about all the lessons I got a plan for tomorrow or the grades or the assessment or the X, Y, Z. Trust me, I have been there many a times. But in 2007, that’s when I was really like, I can’t keep doing this. I laugh now because I love teaching, and it makes me sad that I hit that point, and I felt so lonely about it. Because I know that if you’ve been there, you know. If you know, then you know. That’s when I really started thinking about, well, if this isn’t something I want to do, what do I want to do? It’s okay, like I said, not to know. I know I’ve shared with you many a times that I would encourage anybody and everybody to go get therapy. What I learned from therapy is that there’s a lot of people who don’t know, and there’s a lot of people who are questioning what they’re doing for a job and what they feel like they should be doing. I feel really strongly that social media has had such an influence on that. I was reading an article my husband showed me in the Wall Street Journal and it said that, prior to social media, people, what they valued in their life was their family, their children, their home, and their shelter, their job. Now, with the existence of social media, their job is now at the top of that list. I think it’s because we spend so much time comparing our lives to others these days, that we think that other people have the ultimate life. The ultimate life in a lot of people’s minds begins with their job. As an art teacher, we spend so much time seeing what’s happening in other teachers art rooms that we of course, compare ourselves to that. We compare ourselves to what they’re doing. Oh gosh, not only are they teaching but they are also selling their wares on Etsy and they’re also having a teacher pay teacher. And oh my goodness, they’re also presenting, should I be doing those things? That sounds like a lot. But if that’s what you want, then you need to start really honing in on what it truly is that you want, and how you can start making those steps toward achieving those goals. If you follow your passions, if you follow your interests, then you really can’t go wrong. If you’re like me back in 2007, when I didn’t know anymore what my interest in creating were because I’ve neglected it for so many years, I thought back to what I really liked to do as a child; sewing fibers, anything with my hands. And that’s what started to lead me to creating again. Now, my passions when I’m creating are almost always textiles, whether it be needle faulting or sewing or application. But ultimately, being happy should be your goal. What is going to make YOOOOOOU happy? All caps, lots of Os, you. It’s not going to be pursuing things because you see other people doing it. Trust me, you’ll just get caught in that hamster wheel of comparison. I know this has been a little bit of a ranty blog post, but I just have so much to say about this topic. I’m going to tell you a story, and I hope I don’t get emotional because why does this keep happening? I’m going to tell you a story. When I was a kid, I was the big wheel champ of Joliet, Illinois. If you don’t know what a big wheel is, then you didn’t grow up in the ’80s. So, I will enlighten you. It’s like a bicycle but it was a monster of a thing. It was so amazing and had this giant big wheel in the front and two little wheels in the back, and it was completely all plastic and I wore mine out. I think I went through three big wheels. Because it was plastic, if you drove it up and down your asphalt driveway or your gravel driveway enough, you would wear holes in the tires and then rocks were getting the tires and rattle, which that was really cool. But after a while, my dad would toss it and get me a new one. One day my dad took me and my big wheel to a race, a drag race. During intermission they had all the kids come down, bringing their big wheels and they had a big wheel race. Right before I went down to do the big wheel race, my dad said these words to me, which he was very literal about it. But now as an adult, I like to think back on what he said to me and take it figuratively. He said to me, “Pedal as fast as you can and do not look back. Do not look behind you. It will slow you down.” Pedal, pedal, pedal don’t look back. He literally meant that. He just meant, pedal the living daylights out of this Cassandra Lane and get to that finish line. Mind you, that first race, I did and I walked out with a trophy as tall as me. But it was only because the two girls who were in front of me stopped before the finish line, and I zipped right past them. But regardless, I like to think of that quote now as an adult, pedal, pedal, pedal as fast as you can and stop looking behind you to see what other people are doing. Stop looking behind you at the mistakes you’ve made in the past. Push, push, push toward your goal whatever it is. Even if your goal is simply being happy, getting home at a decent hour and making a good meal for your family. Whatever it is, push toward that. Your goal, your pursuits. I think that’s what’s going … You’re going to realize, that’s where the happiness is. Thank you for letting me share. You all are the best. Tim: Hello this is Tim Bogatz from Art Ed Radio. I want to talk to you today about Art Ed PRO, the essential subscription for professional teachers. It is on demand professional development with video tutorials, downloadable handouts, and all kinds of other resources to help take your teaching to the next level. As of next week, the library will have 96 learning packs in it, and it will continue to grow. Coming up in April are our new learning packs on planning art works with students, on art and math and painting within cost x. With so many topics already covered, and three more packs released on the first of every month. It is the PD you need when you need it. Make sure you check it out and start your free trial at the artofeducation.edu/pro. Now, let me turn it back over to Cassie so she can open up her mailbag. Cassie: Now, it’s time to take a little dip into the mailbag. This one starts off by saying silly question, did you always have this amazing style as a teacher? You all know I’m only reading you this question because she said I had amazing style, right? Yeah, that’s what I thought. I think, getting back to what she said, I think I am kind of fun librarian who would like to be more outgoing when it comes to my style but the kids and the staff they already know how I dress. Is it weird to start using a different style or did I already lose my chance? I know this is a really odd question. You all, this is not an odd question. I 110% love that question because that was me, I was that. When I first started teaching millionaires go that’d be 20, I firmly believed that I should get rid of all of my thrift store clothing because I was a big, thrifty gal, and dress professionally. There was a lot of, now this is late ’90s there were a lot of jean jumpers, not the cute kind either, you all. A lot of jean jumpers. I know I had a pair of tweet pants from Talbots. Could you imagine me in pants from Talbots? I wore some really unfortunate flats and I was pretty miserable. Because I was just wearing things that I felt like I should wear. I remember I started wearing some funky earrings and the kids flipped out, they loved it. Started buying some artsy t-shirts, the kids always commented on it. Then, the next thing you know, I was just going completely bonkers, resulting in what you have here before you today. It all is dependent on your comfort level. I like to wear clothes that are, number one, comfortable. Number two, crazy. Once you put something on, I forget that I’m wearing it. There’s a 99% chance that if I’m dressed like a crazy person and I go to the grocery store and people stop and look at me or say something, I’m like, what are you talking about? Oh, this, the Campbell’s soup can that I happen to be wearing? Yeah, I’m an art teacher. Ultimately, you do you, you do what makes you happy, and you wear what you want to wear. Life is just too short to care what other people think. Other people are going to have a lot of things that they’re going to think and they’re definitely going to say. You can either take it and let it bother you, or take it and not. Toss it in the trash can where it belongs. I say, go for it. If you have a question for me, you should send it my way. You can find me at the [email protected] artofeducation.edu. So, long story short, if you feel like presenting, present, if you feel like opening an online store, do it. It might help you figure out what your ultimate goal is. If you got an ultimate goal, then stop and think, are these things that I feel like pursuing going to help me reach it? Because if not, maybe I should figure out how to do that instead. Whatever you do just know that everybody around you; online, in your for realsy life, they’re all trying to figure it out too. Nobody knows all the answers, despite appearances. Staying true to you is what’s going to get you closer to what you want, and who you truly are. That is where the happiness is. Have an awesome week, guys.